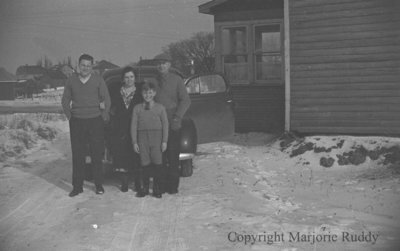 A black and white negative of an unidentified family standing outside in winter. From left to right: unidentified man, unidentified woman, unidentified boy and unidentified man. In this view they are standing in front of a car. The driver side door is open. There is a house on the right side of the photograph. Unidentified Family, c.1947, Marjorie Ruddy. Whitby Archives, A2013_040_843B.